HPC Data Centres is a Western Australian owned and operated provider of world-class data center facilities and associated services. When HPC built its first dedicated co-location hosting facility, the Australian Marine Complex Data Centre (AMC DC) in Henderson, 23 kilometres south of Perth, it approached Stott Hoare for the supply, installation and support of Tier 1 IBM and EMC server and storage architecture. A key feature of HPC Data Centre’s unique offering to Western Australian businesses is its nBase compute and storage platform which supports virtualised services including naked blade, and managed services delivering VMs, Hyper V and managed blade solutions. “Significant features of HPC’s nBase suite of solutions are their reliability, safety and security – and the ease and speed with which server and storage capacity can be increased to meet our clients’ growing needs,” said Paul Newman, HPC Data Centres Sales Director. “Clearly, in any data centre reliability is paramount, and the track records of IBM and EMC were absolutely unrivalled. “Stott Hoare has over two decades experience installing and supporting server and storage systems throughout Australia, and has been at the forefront of the industry-wide move to virtualisation,” said Brian Hawkins, Stott Hoare Sales Manager. “We also see at as a significant advantage for a client such as HPC Data Centres that Stott Hoare – like HPC themselves – is WA-based, owned and operated. “Two absolute platforms of HPC’s business model are rocksolid reliability and fast scalability for its clients. “With Stott Hoare, HPC gains the significant benefit of a local, technically-expert supplier. That means that not only do we thoroughly understand IBM and EMC server and storage technology, but importantly, we hold local stocks of hardware and peripherals, so we’re able to supply and install very quickly when required – and also provide 24/7 on-site support. HPC established its AMC Data Centre in January 2010, however, HPC was extremely rigorous in proving the reliability of its nBase services, so it was not until July 2010, after a 6-month development and testing phase, that the service went live – without a hiccup. The HPC AMC Data Centre has 240sqm of purpose-built technical space. It is a secure environment with quality infrastructure and leading edge design. It has sophisticated power distribution and UPS systems, backed up with Caterpillar diesel generators for both critical and non-critical loads. Cooling, communications and security and facilities management are all state-of-the-art, as are the centre’s environmental attributes. ‘Naked blade’ or pre-configured fully managed servers. Option of client-specific ‘single tenancy’ blades. Immediately scalable – nBase can deploy a managed blade and provide network access within 1 working day. nStor provides similar flexible, scalable storage options on an EMC platform. Stott Hoare’s solution for HPC began with the IBM BladeCentre H platform. BladeCentre H provides industry-leading performance, innovative architecture and a solid foundation for virtualisation. It is a rack-dense space saving chassis, with a flexible, scalable design, and IBM Light-Path diagnostics enable fast, simple and accurate troubleshooting to guard against downtime. Significantly, the BladeCentre H chassis has a high efficiency power supply that is 94% efficient and 80 PLUS Platinum Certified. BladeCentre H also provides 12% greater performance per watt than comparable competitors. IBM BladeCentre HS22V high-performance blade servers with Intel Xeon 6C processors provided the combination of power and energy efficiency HPC required. With 18 DIMM slots supporting up to 288 GB of DDR3 memory, the HS22V allowed HPC to fit more and larger virtual machines per blade, and durable solid-state drives and hardware RAID-0 and -1 provided outstanding reliability when virtualising multiple workloads on a single blade. An embedded hypervisor enabled easy deployment of industry-leading third-party virtualisation solutions. 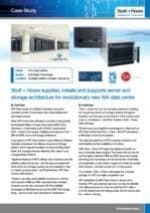 Stott Hoare also supplied HPC with the EMC VNX 5300 unified storage system with 20TB usable capacity. EMC VNX delivers industry-leading innovation and capabilities for file, block and object storage in a scalable, easy-to-use package which ideally suited HPC’s requirements. The VNX operating environment is simple, efficient and powerful, and enables the management of multi-protocol file systems and multi-protocol block storage access. The platform is powered by Intel Quad Core Xeon 5600 series processors, and delivers demonstrable performance improvements. Up to 12.8 GB of mirrored write cache, where each storage processor contains both primary cached data for its LUNs and a secondary copy of the cache for its peer storage processor. RAID protection levels 0, 1, 1/0, 3, 5, and 6 – all of which can co-exist in the same array simultaneously to match different protection requirements. Proactive hot sparing to enhance system robustness and deliver maximum reliability and availability. Redundant data paths, power supplies, drive connections and storage processors – all with nondisruptive field replacement capabilities. Continuous system monitoring and advanced remote diagnostics. “Stott Hoare is pleased to have partnered with HPC Data Centre in the exciting development of their AMC Data Centre and innovative and unique nBase scalable server and storage infrastructure,” said Brian Hawkins. “We’re two proudly Western Australian companies, and I believe we’re both offering innovative technology solutions that are adaptable, leading edge and cost effective. “It’s a great combination. The very best information technology infrastructure in the world with the security and convenience of locally-based suppliers offering complete, end-to-end solutions,” concluded Brian. To discuss how Stott Hoare can provide a cost-effective end-to-end solution for your IT requirements, please contact us on (08) 9244 0000. Stott Hoare is dedicated to providing excellent service by truly understanding clients’ unique requirements, offering valuable knowledge and experience, and engaging a talented workforce to design, install and support leading brand technology.